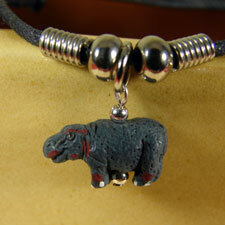 A hand-painted ceramic hippo dangles from a black cotton cord that is fully adjustable to fit any wrist size. (Unless you have hippo-sized wrists.) This is a fun and inexpensive item that can be worn for work or play and is gender-neutral. It also makes a wonderful gift item!